The highly anticipated Mighty Crown/Nike Dynasty High sneaker made it’s official debut in Japan a day following Crown’s Yokohama Reggae SAI stadium show. Way before the Dynasty High’s release, the demand for the sneaker was heavy. In Mighty Crown’s Yokohama-based store, an incredible 500 pairs were sold in one day. Although Mighty Crown believed that the sneaker would do well, never did they fathom such a response. With a line wrapped around the corner of their store for the sneaker, Mighty Crown’s members couldn’t help but flash warm felt smiles. The limited edition sneaker is due to hit the States any day now. If the U.S. response to the sneaker is anything like that in Japan, the Dynasty High will fly off shelves. The sneaker will only be available for a brief time, so one should not delay copping a pair. Calls from sneaker aficionados and collectors through out the world have been flooding Mighty Crown’s phone lines. It’s reported that the price per sneaker has peaked at $350.00 on the internet. 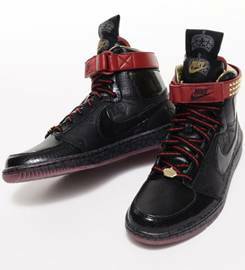 Notably, the Mighty Crown Dynasty High represents the second time that Mighty Crown has joined forces with Nike. The first time around, in 2006, these entities released the Mighty Crown Pack consisting of the infamous Dunk High and Court Force Low sneakers. The Mighty Crown pack was a hit among sneaker freaks and celebrities and everyday folks.